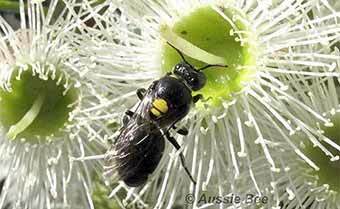 Australia has over 1,700 species of native bees and 70% of these species build nests in the ground! Some, such as Blue Banded Bees and Teddy Bear Bees, dig shallow burrows in clay soil. Others, such as Homalictus Bees, may dig burrows that are well over a metre deep. In many species, just one female uses each nest burrow, while in other species a nest burrow may be shared by dozens of bees. 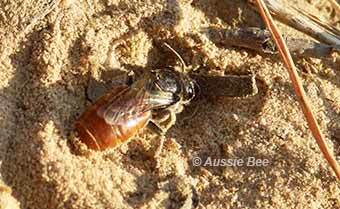 A ground-nesting native bee busily digging her nest in a bare patch of ground. The bees often prefer sandy or loamy soil with good drainage for their nests, and sites that are covered with little vegetation. In some species the nests are easy to spot -- a small conical mound of excavated soil surrounds the opening of each nest. However, the nests of other species may be very hard to see -- they are just tiny holes in the flat ground and the bee kicks soil over the entrance hole to conceal it when she leaves. Nest blocks for Blue Banded Bees can be made from clay soil pressed into a section of drainpipe or other container. However, providing nest sites for species that dig deeper burrows is more challenging. A good starting point is simply to leave some areas of ground in your yard bare, instead of covering all the yard with lawn, mulch, weedmat or pavers. You could also experiment with making a raised bed of sandy loam, at least 60 cm deep, for your local bees. Overseas, systems have been well developed for creating nest sites for some species of ground-dwelling bees (e.g. the Nomia Alkali Bees that pollinate alfalfa crops). However, little experimentation has been done so far in Australia for our hundreds of ground-nesting native bee species. Perhaps you could help by trying out some ideas in your backyard!